A rainy season sea of grass. Matenity Annex on left. and the Friends and Members of St. Philip the Apostle Orthodox Church Tampa, Florida. 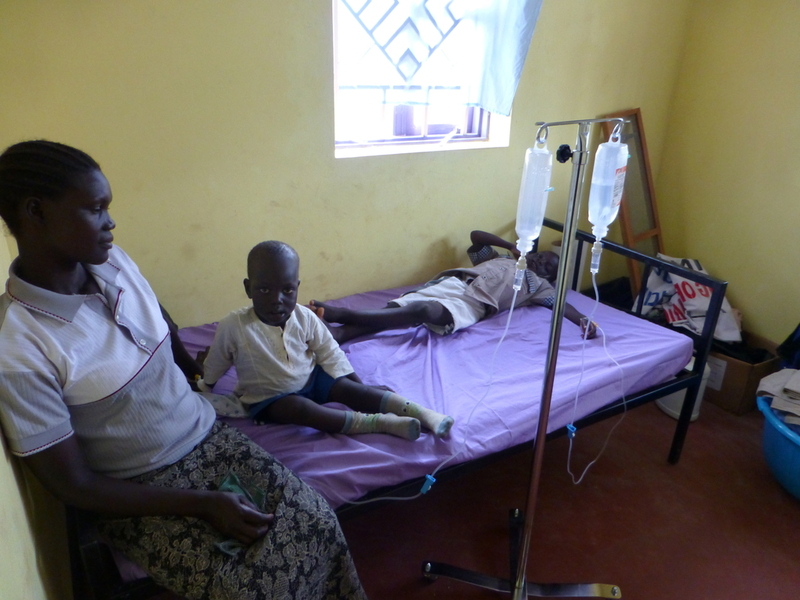 The Akonyibedo Medical Center is located in northern Uganda approximately thirty mile south of the South Sudan Boarder. It was dedicated and began seeing patients in January of 2014. Since that time, by necessity, the originally anticipated staff of an R.N. 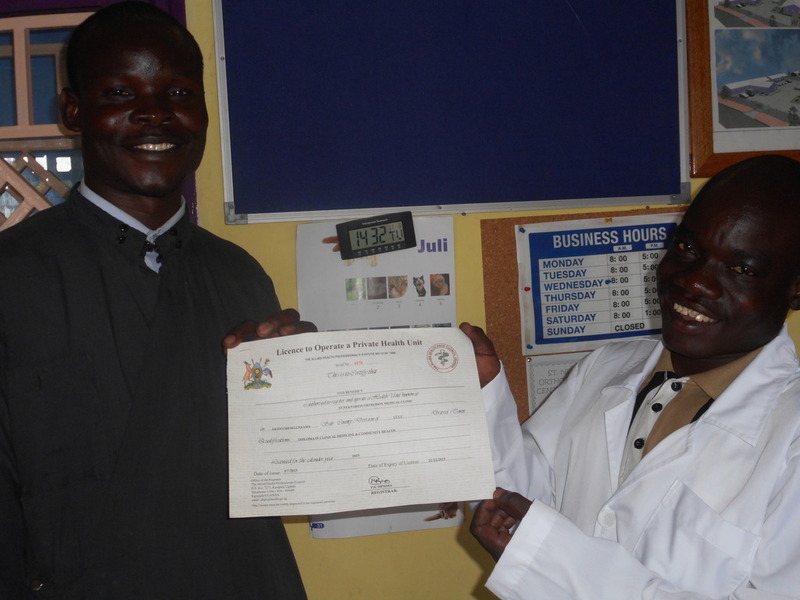 and lab technician has expanded by adding a clinician (the Ugandan equivalent of a physician), a nurse's aide, an administrative person to allow the medical personnel to focus entirely on the medical needs of the patients and a night watchman/handy man. In August, 2016 a 550 sq. ft. maternity annex was added. At the same time a nurse/midwife was added to the staff. Shortly thereafter an R.N./midwife was added along with a second handy man. Fr. George, pastor of the local parish as well as two other parishes, continues as the Center director. The medical center serves the surrounding villages where previously there was no medical services at all. Ugandan life expectancy is 54 years and the infant mortality rate is 10 times that of the U.S. We are serving some of the most needy of God's children. 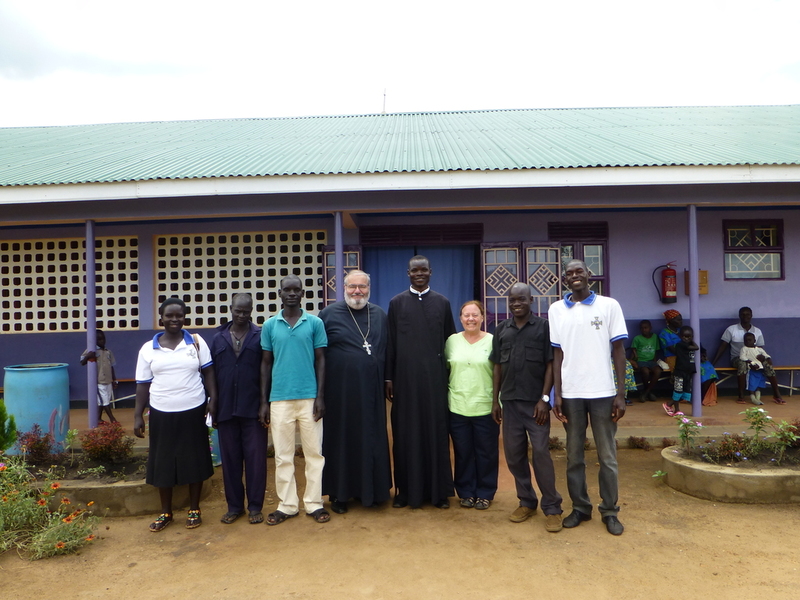 His Grace, Bishop Silvestros, Bishop of the new Diocese of Gulu and Eastern Uganda, visited our Medical Clinic. Fr. 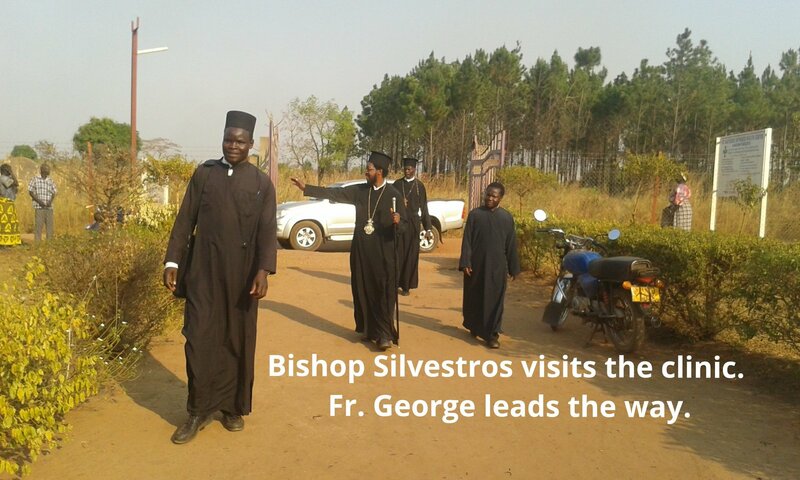 George, the Center director, accompanied the bishop and told him of the history of it and the medical services that it provides for the people of the area. Our center is now under the authority and care of Bishop Silvestros. His Grace met with a number of staff members as well as patients. He was pleased with the Medical Center and with the services that it supplies to all people in the area regardless of their faith. 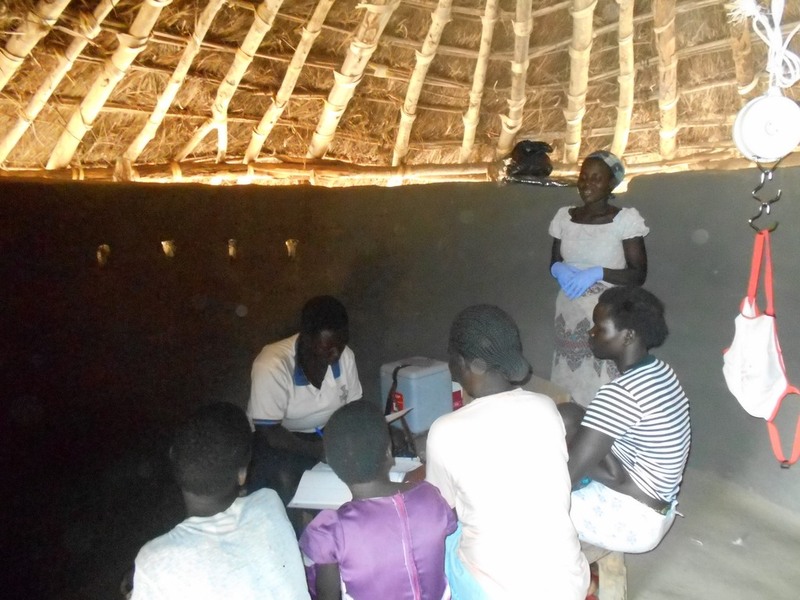 In order to better serve the people of the more remote outlying villages, the Center staff has begun periodic mobile clinics. 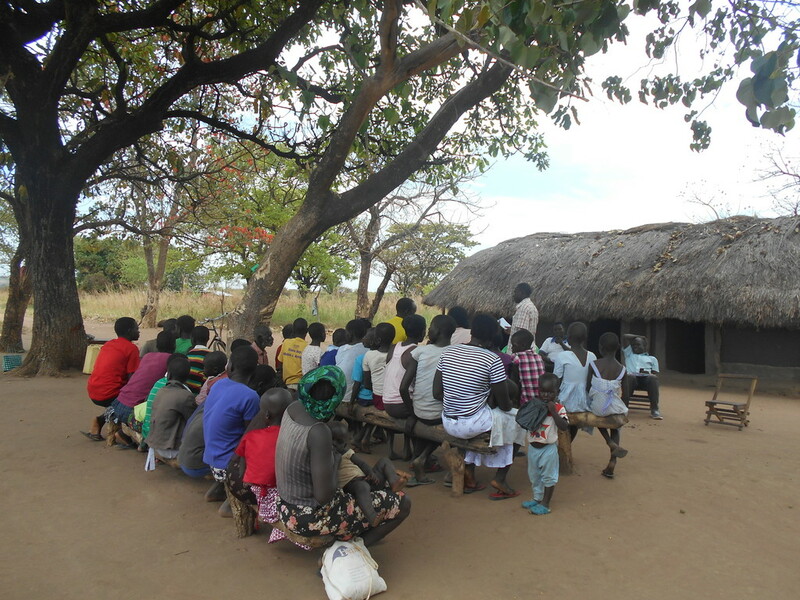 Held in the various villages, health classes are taught while at the same time patients are being seen for a variety of diseases. The staff take medicines with them which are then dispensed as prescribed by the clinician or the R.N. Intestinal worms and malaria are pandemic. Patients have presented with tuberculoses as well as leprosy. 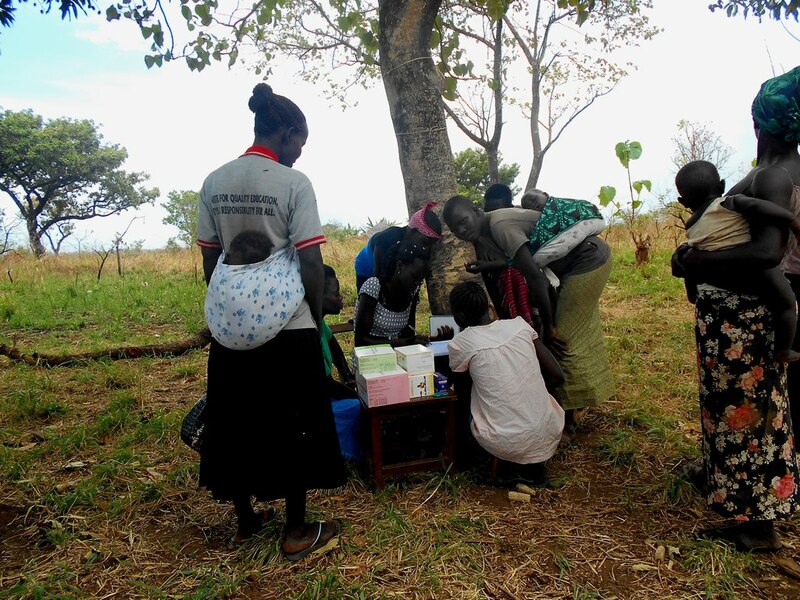 These mobile clinics, though a strain on the staff, are a necessary part of our effort to improve the health of these wonderful people of northern Uganda. Another dream for the clinic finally comes true, thanks be to God. 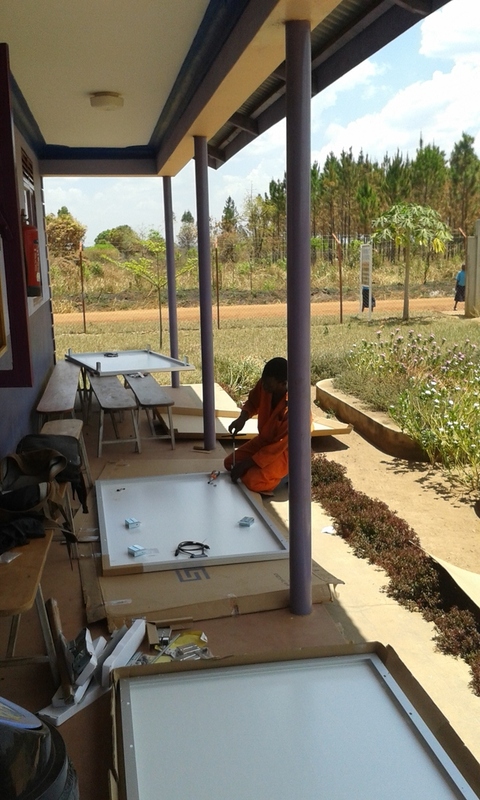 Two years and two months after opening, the medical clinic we have solar powered lights and electricity in the building. The system was expensive because everything is imported from Europe and then trucked to us from Kampala the capitol. An example is the batteries which are made in Germany, but by the generosity of our supporters we finally had enough funds to complete the project. 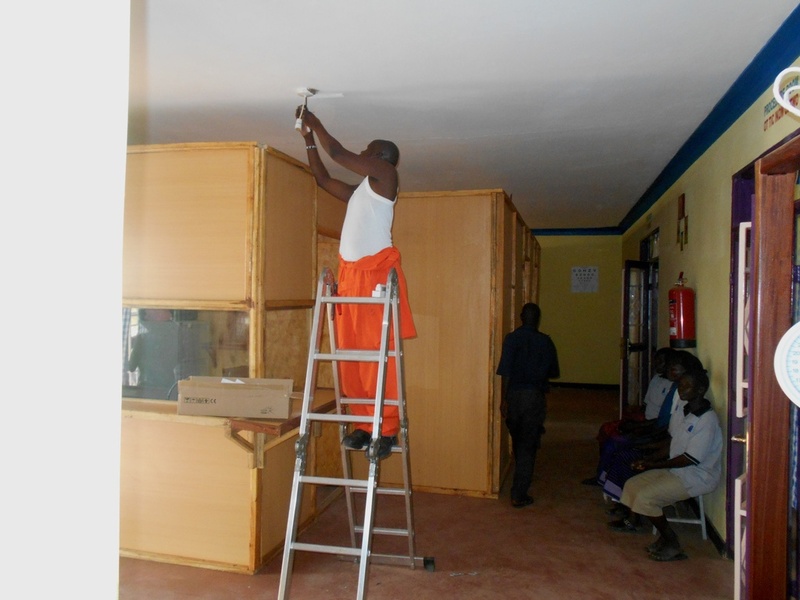 We had no choice in installing power since we are now also treating inpatient. Two small rooms were created in our formerly large waiting room, (see photo below). 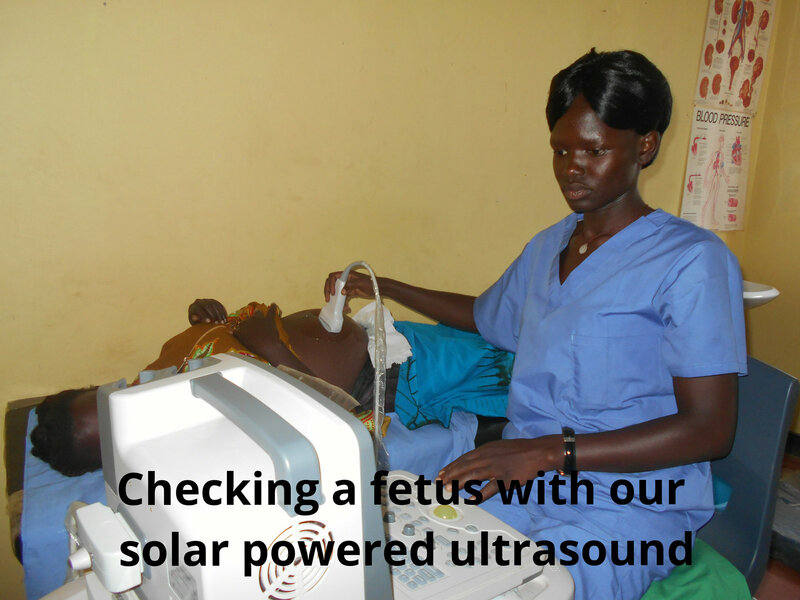 Our next project is to obtain the necessary equipment for use by a midwife. Also staff salaries are funded from donations raised in the United States. PayPal donations may be made on this website. Another milestone for the Medical Center. After having to retain a different company, a refrigerator for the storing of vaccines was installed. Powered by its own dedicated solar panels and its own batteries, this special refrigerator can store vaccines for an extended period of time. 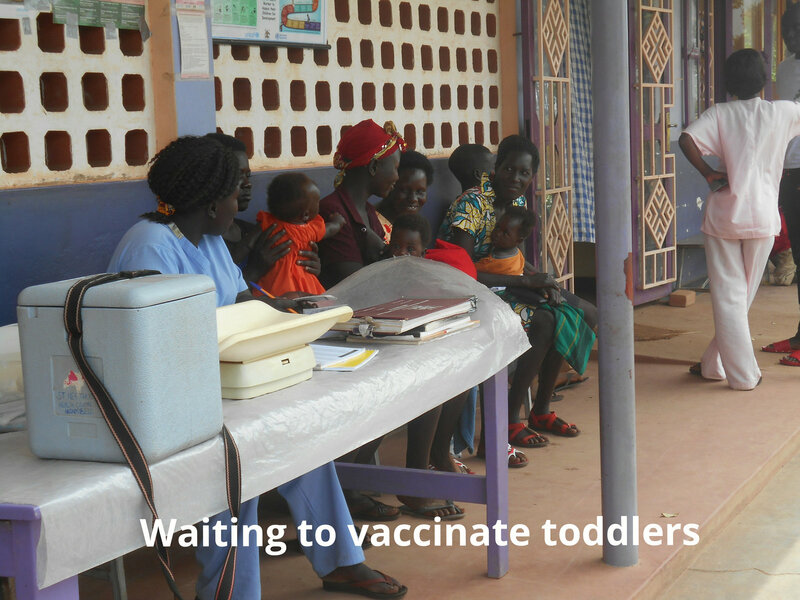 We will now be able to begin a vaccination program for the children, something they have never had before. This refrigerator, like everything else at the center, was made possible by the generosity of so many in the United States, both Orthodox and non-Orthodox. 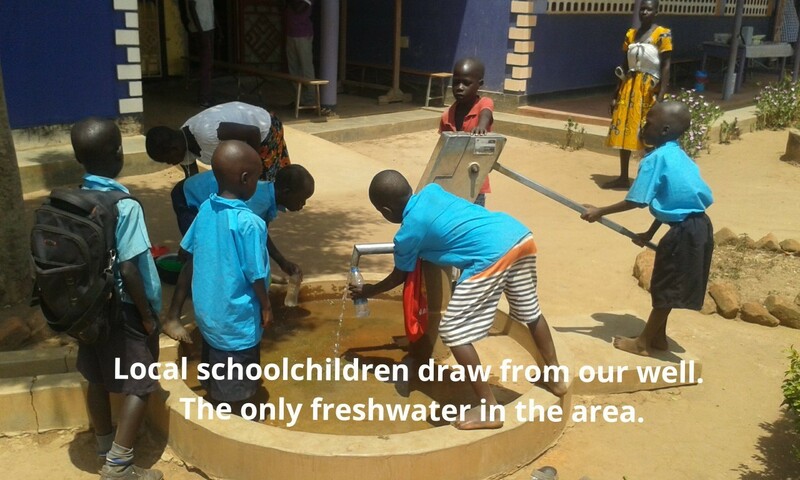 Children drink from our well. AT LAST, CLEAN, FRESH WATER! 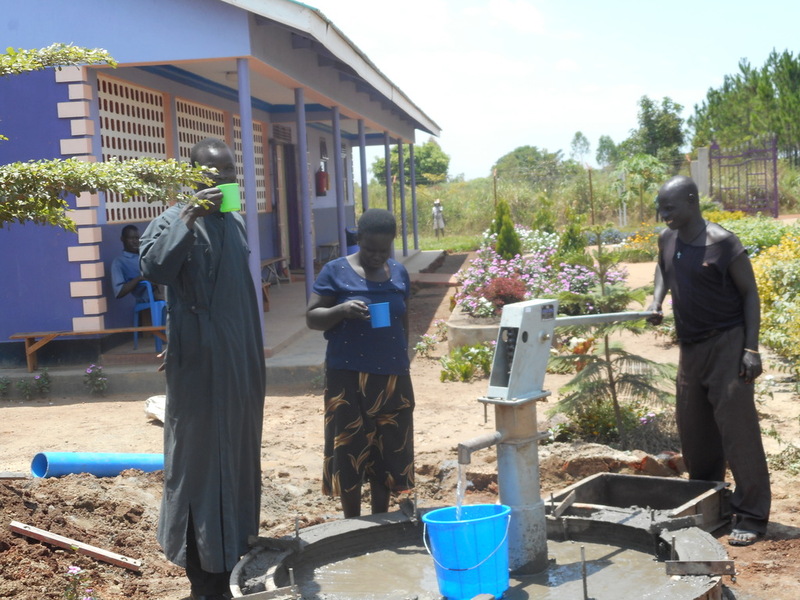 Deep drilling at the Clinic results in a well of fresh, drinkable water. The drillers have completed their work and our dream of having a reliable source of potable water at the clinic has been realized. Having previously conducted a geophysical test of the clinic property revealed the presence of water in the rock that lies below the soil layer. The drilling company's confidence that water would be located in sufficient amounts to serve the needs of the clinic and those of the local population was born out when after drilling hundreds of feet the water was located. 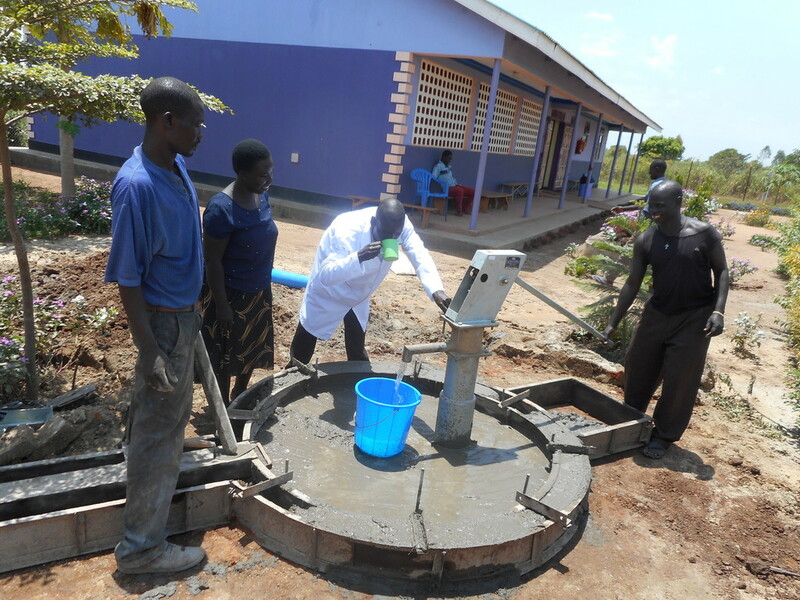 A hand pumping station was installed and, by the grace of God, another clinic dream has been realized. Brothers in Christ serving mankind. AND CONTRACTS FOR A WELL AND SOLAR POWER ARE MADE. Staffing has been dramatically added to meet unanticipated need. Leaving on July 27th, Fr. Joseph and Nurse Practioner Sue once again traveled the 8,500 miles to the medical center which is located about 25 mile south of the South Sudan boarder. 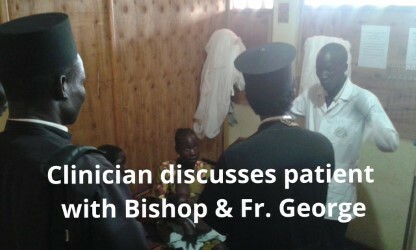 After greeting and conferring with His Eminence Jonah, Metropolitan Archbishop of all Uganda, they traveled by dirt road the 190 miles from Uganda's capital Kampala to the clinic. Nurse Sue, supervised an inventory, checked the center records, met individually with each member of the center staff, chaired a staff lunch meeting and still made time for her first love, the treating of patients at the clinic. Fr. Joseph and Fr. 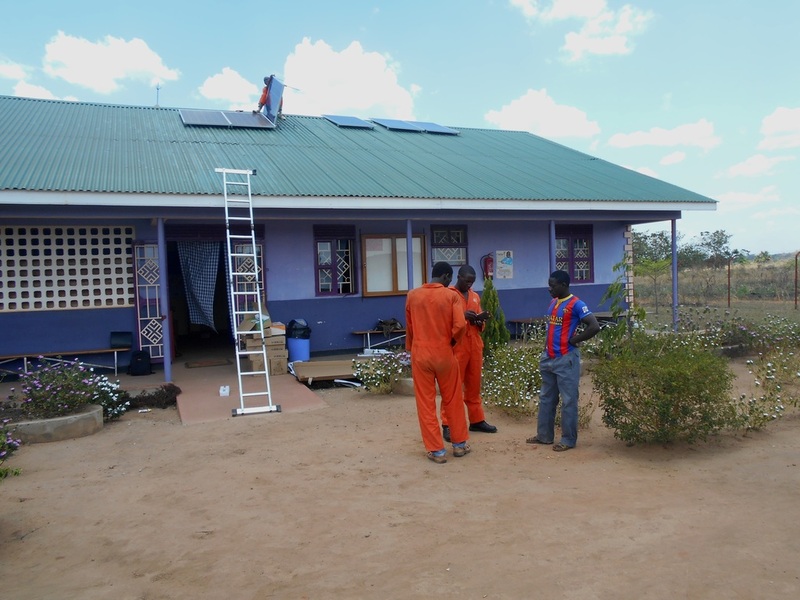 George, the director of the clinic (in addition to serving three parishes and a preschool), met with a drilling company and with a supplier and installer of solar power. Discussions and negotiations continued for several days and finally an agreement was made for the drilling of the well and for the installation of solar power. 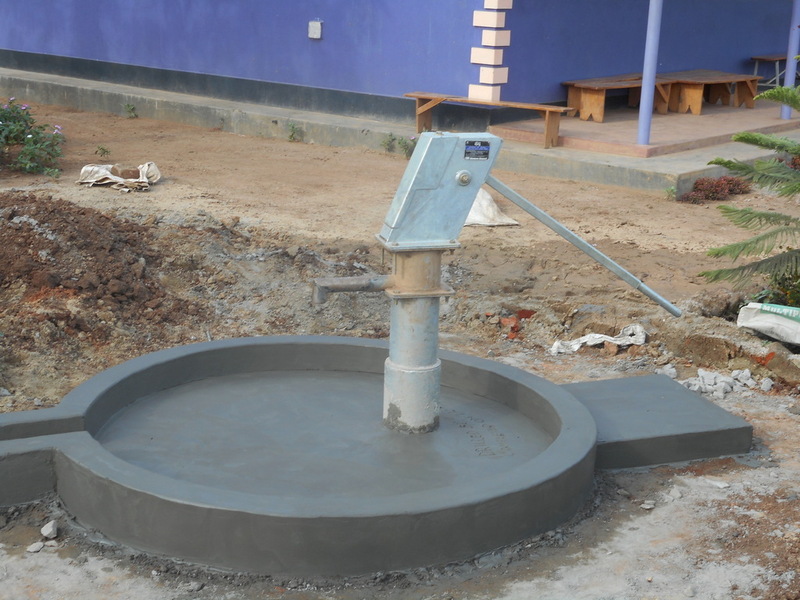 The well will be drilled into rock and will supply potable water for use in the clinic. The villagers will be encouraged to draw from the well for their cooking and drinking needs and for brushing their teeth. This should help to improve their overall health. The driller agreed that he will drill until he reaches water and if a dry hole is drilled he will continue to drill at no extra charge until a usable well is in place. 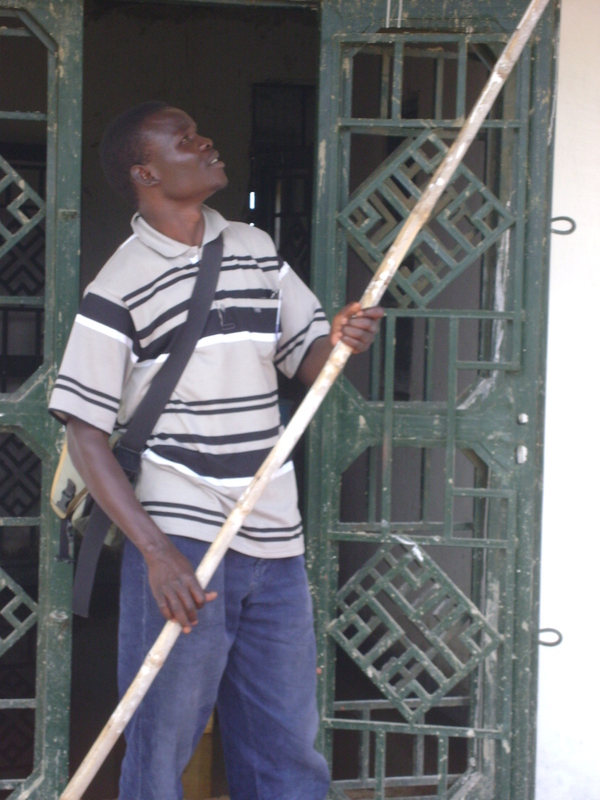 Initially a hand pump will be used to draw water. 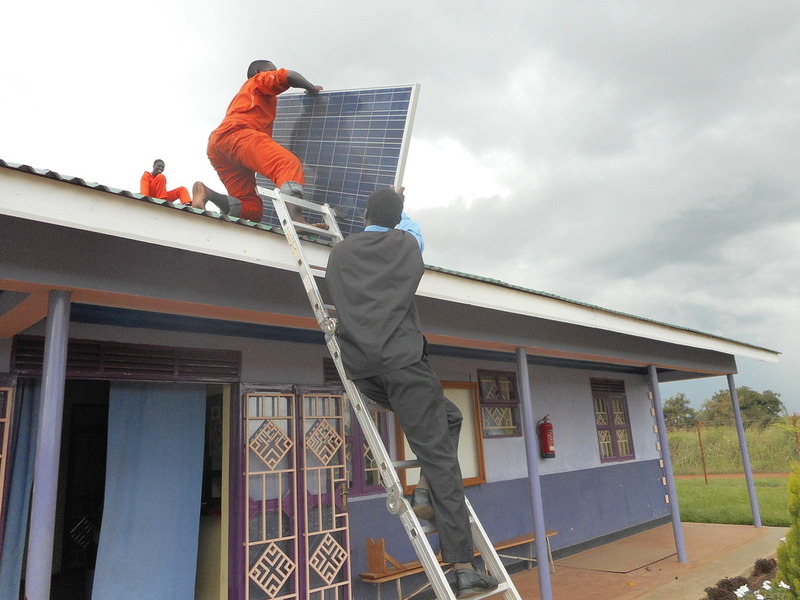 Solar panels and appropriate batteries were contracted for and will be installed for the electrical needs of the clinic. A specialized refrigerator for storing vaccines was ordered and a sterilizer was purchased as well. 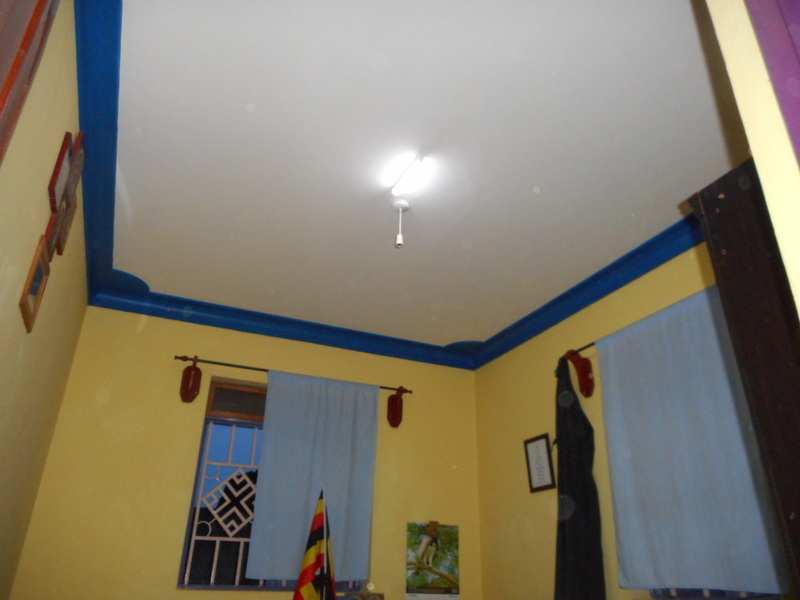 The immediate need for lighting was made evident as the clinic overflowed with patients due to a large and virile outbreak of malaria. 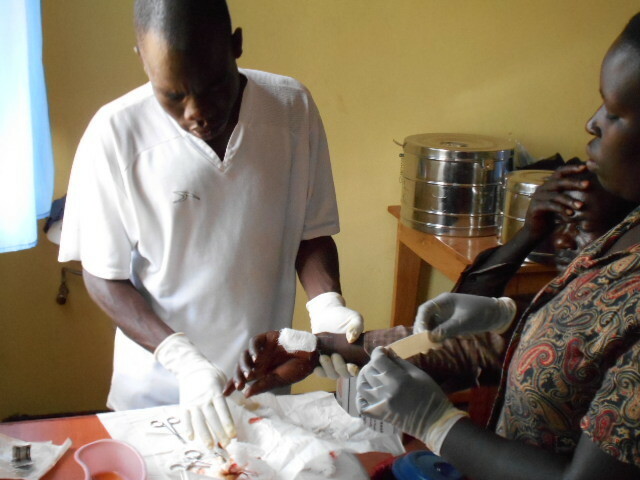 Many patients had to be kept overnight to administer IVs and the malaria medication. Likewise several venomous snake bites have been treated and those patients also must be kept overnight. 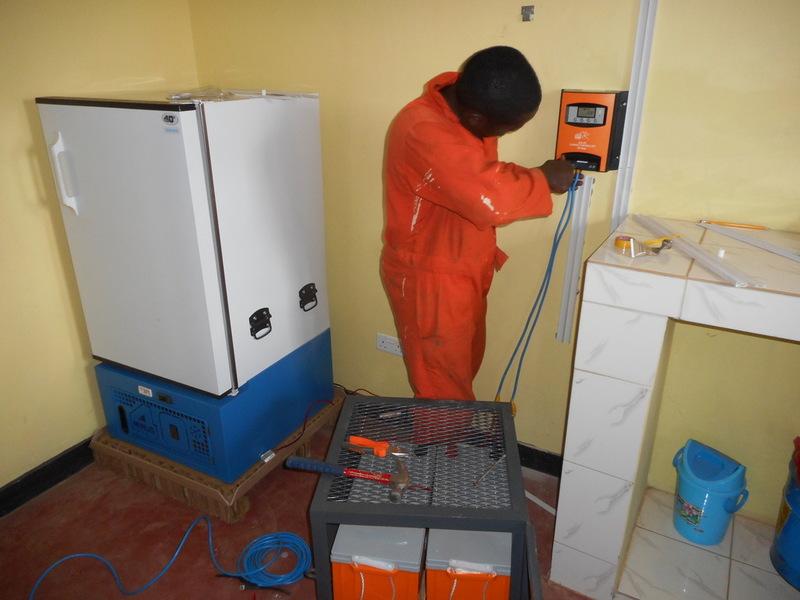 The clinic was built with the foresight to prewire it for power, so installation should be relatively fast. Originally, we had intended to have a staff consisting of a nurse and a lab technician. Because of the high need for services and the complexity of some of these services we have added a Clinical Officer. This is the Ugandan solution to a critical shortage of medical doctors. Likewise we have added a nurse's aid and an administrative aid to assist Fr. George. We also have a night watchman for safety and security. Our next project is a very pressing one. We need desperately to add a nurse/midwife to the staff. Infant mortality is ten times that of the U.S. and we must attack it at its root. The biggest cause of infant deaths is the total lack of any antenatal services. 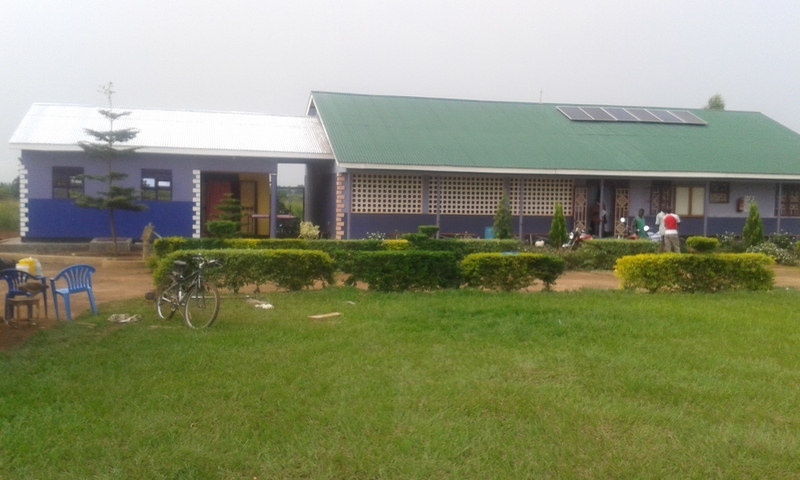 While at the clinic, an incursion into northern Uganda by South Sundanese militia to a point within approximately 20 miles of the clinic occurred. The invaders were quickly repulsed by elements of the Ugandan Defense Forces. Father Joseph and Nurse Sue have never felt in danger including this visit. For Nurse Sue it was her ninth visit and Father Joseph's fifth. Donations may be made to the medical center through links on this website. All contributions are 100% deductable and all moneys received are used for the direct support of the clinic. Dr. Sue with the staff. These children of Akonyibedo Village in northern Uganda are the fortunate ones. They have survived an infant mortality rate ten (10) times that of the United States. However, most of them will not live beyond their mid fifties, the life expectancy in Uganda. This is only 2/3s that of the United States. 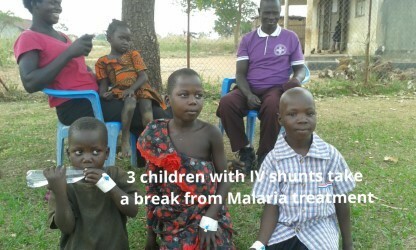 All of these children are infected with intestinal worms and many have already suffered at least one bout of malaria. A recent study showed that at any given time 64% of them are sick. Right now it is relatively secure in their village but should the rebel forces return they could be pressed into service as soldiers by the rebels at the age of 10, 11 or 12. This happened to their parish priest when he was 12. After one month he escaped and hid out on his own from the rebels. When they are old enough they will help their parents with the subsistence farming that is the way of survival in this region. More than anything they need a medical clinic. There they can be vaccinated, receive tablets to keep them free from worms and receive treatment for their diseases. What does this mean overall for them. Simply this; longer, healthier and happier lives. For them we have undertaken to build and staff a medical clinic located just outside the village to serve all of the people of the region. Some may ask: "why doesn't their government do it?" The answer is that it does not matter. Simply put, either we do it or there will continue to be no clinic. Please read the other articles on this website, review the photos and then click on the "Donations" tab at the top of any page. Thank you and God bless you. in gold vestments. Metropolitan Jonah is in the background. Ugandan chanting from the grouund breaking. I am Fr. Joseph Ciarciaglino, pastor of St. Philip the Apostle Orthodox Church in Tampa, Florida. 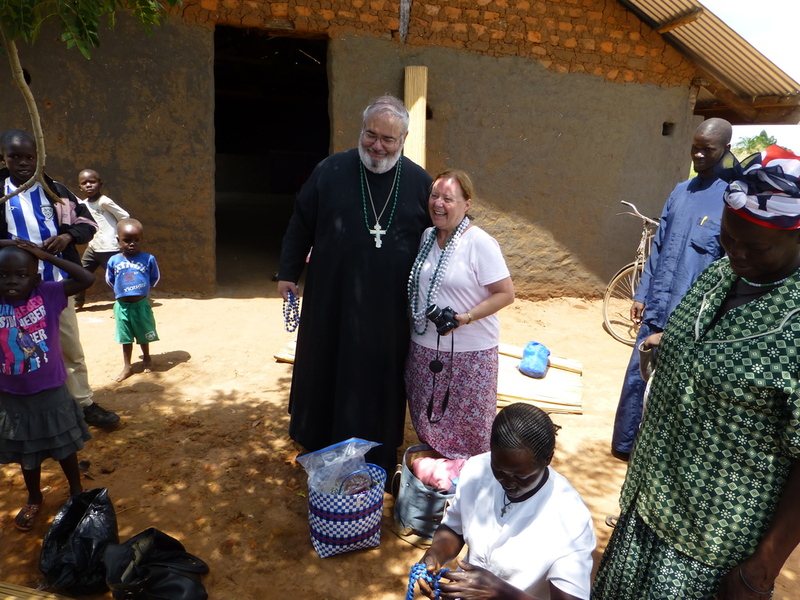 In 2010 I had the great privilege to serve on a short-term medical mission team to northern Uganda, under the auspices of the Orthodox Christian Mission Center. 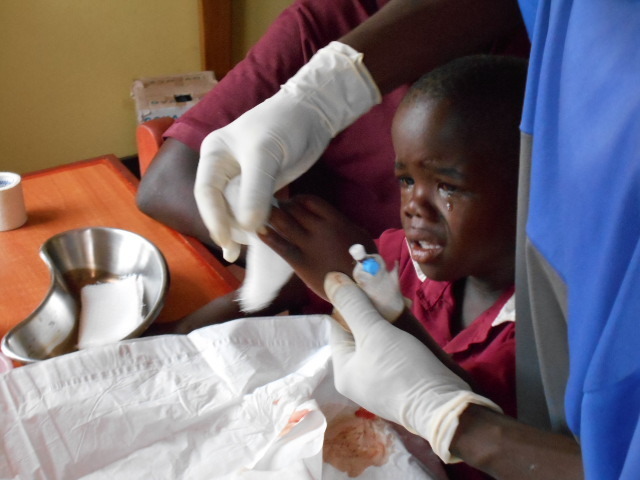 In ten days our doctors and nurses, aided by several laymen, treated almost 3,800 people. This is a testimony to the wonderful heath care providers who were on the team. 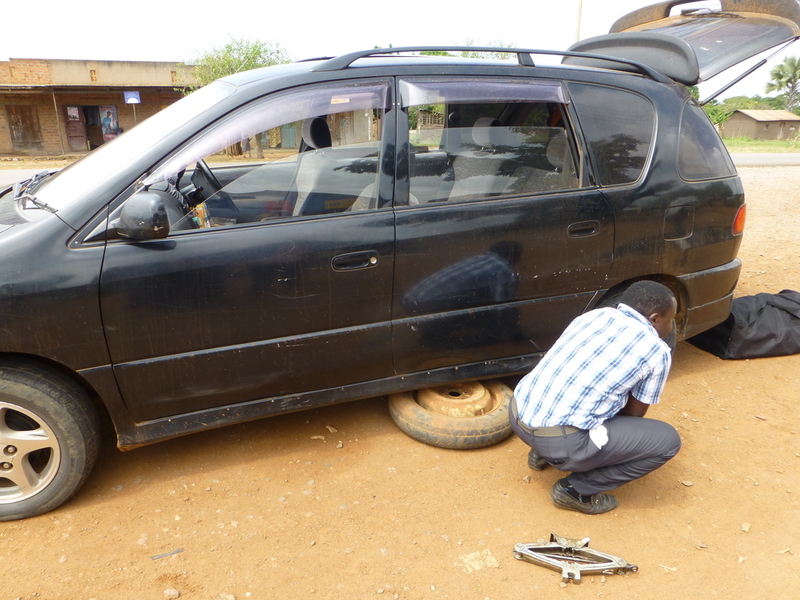 For most of the people that we saw this was the first medical attention they received since the team was there in 2009. It would also be the last that they would receive until the team returned in 2011. Malaria and intestinal worms were pandemic. Patients presented with tuberculosis, dysentery, open wounds, broken arms and legs that had not been set and even leprosy. Many of these people were only two years removed from the displaced person camps into which they had been forced due to previous rebel and terrorist activity. Some evenings our traveling pharmacy did not finish filling the doctors’ orders until after dark by the light of a kerosene lamp. None of our mobile clinics had electricity, running water or toilets. Upon my return home, of all of the sounds and sights of this trip there was one thing that I could not get out of my mind. If I close my eyes even now I can plainly hear one of the interpreters telling the triage nurse: “He knows that he is filled with worms because he can feel them moving around.” I was appalled. I knew that there were tablets that could effectively deworm a person. And for want of a few pills this horrible condition existed in most of the people we saw. I could not get the wonderful people of Uganda out of my mind. I kept up an email correspondence with Fr. George and we discussed building a clinic in Akonyibedo village. If Archbishop Jonah, Metropolitan of all Uganda, gave his blessing I would try to raise the funds and Fr. George would oversee the construction. In June of 2012 we received permission. Our first large donation was from the Tampa Bay area Pan-orthodox vespers’ charity collections. The Orthodox Clergy Brotherhood of Greater Tampa Bay voted to donate the entire collected amount of $6,500 to the clinic. My own parish of St. Philip the Apostle has been most generous in its collective contributions as well as understanding as to the amount of my time necessary for this project. 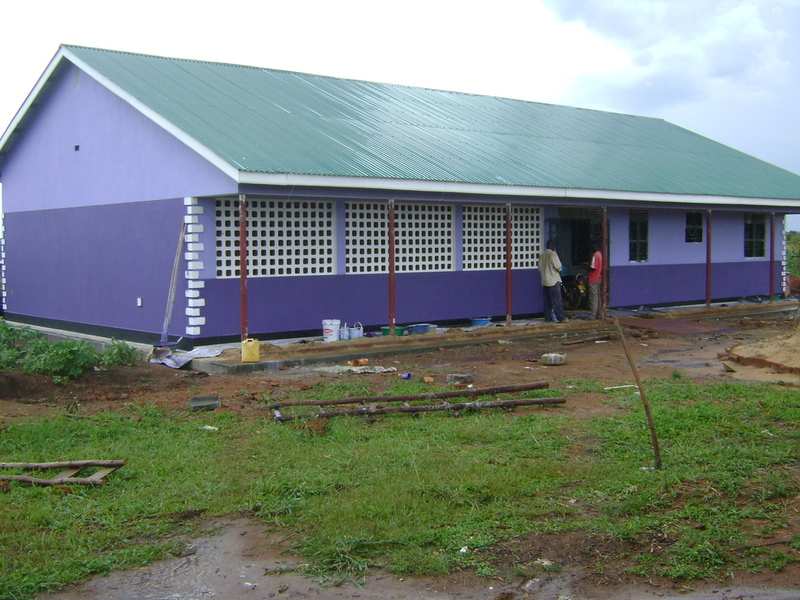 To ensure the operation of the clinic once it is opened, St. Philip parish has committed to paying the nurse’s salary for two years. Our parish in Jacksonville, St. Justin Martyr, has committed to paying the lab technician’s salary for the same period. In December of 2012, I was once again among the people of northern Uganda whom I have come to know and love. We met with the Metropolitan to give him an interim report, a bank account was opened, plans approved and job offers extended to and accepted by a nurse and laboratory technician to staff the clinic. Construction has now begun. Fr. George tells me that every day people come from all around to see the progress and that many tears of joy are shed. Our long-term plan is to provide running potable water from a deep well. This will be very expensive. 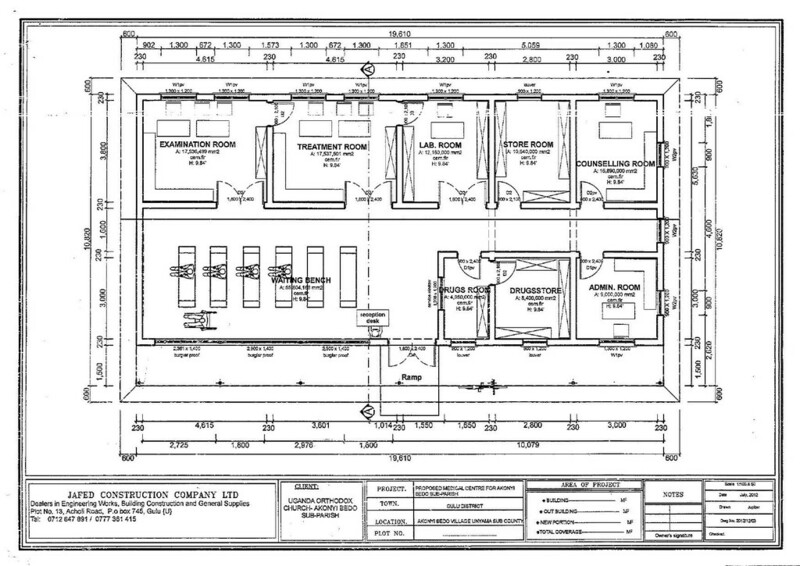 Likewise we hope to build staff quarters so that the nurse and lab tech can be on call afterhours. Finally our plan is to build a birthing facility in an attempt to reduce the infant mortality rate. To do this we need your help. Please click on the “Donations” button at the top of the page. 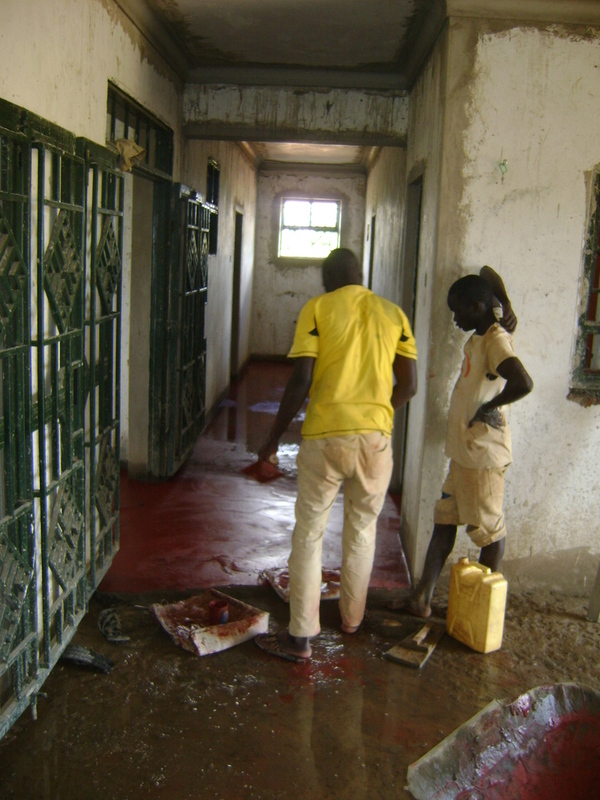 Red cement is used to finish the floor. A second coat of primer. Fr. George shows how it is done. Attention to detail with the white trim. 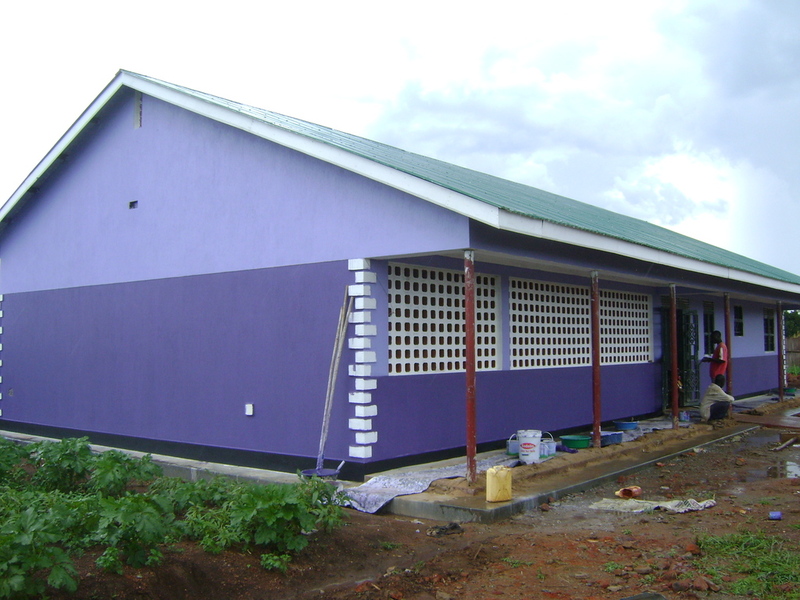 By the grace of God, the first phase of construction is nearing completion on the medical clinic in Akonyibedo village in northern Uganda. With native pastor Fr. 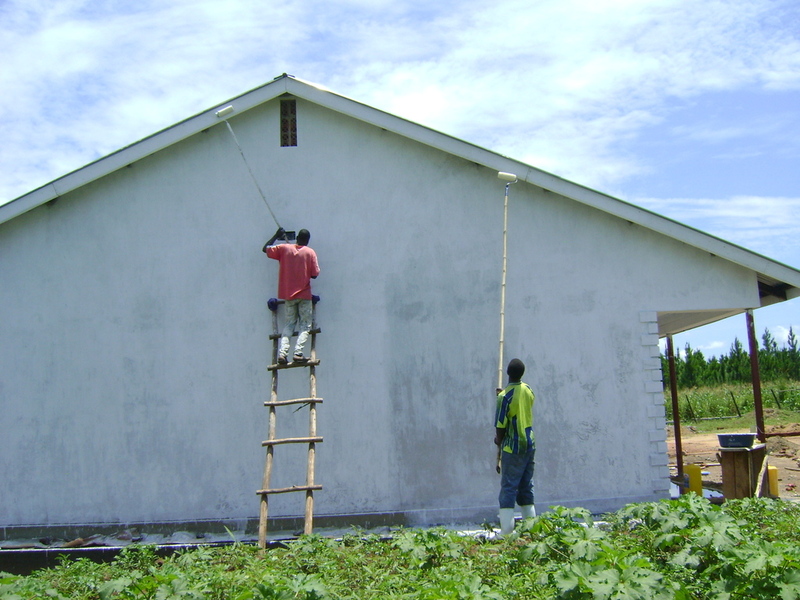 George in overall charge of the project, we are now painting the clinic. Remaining to be done before opening is the building of the latrine and of the incinerator as well as fencing the property. All construction is by hand, from digging of footers to the mixing of concrete, to the building and installing of trusses. 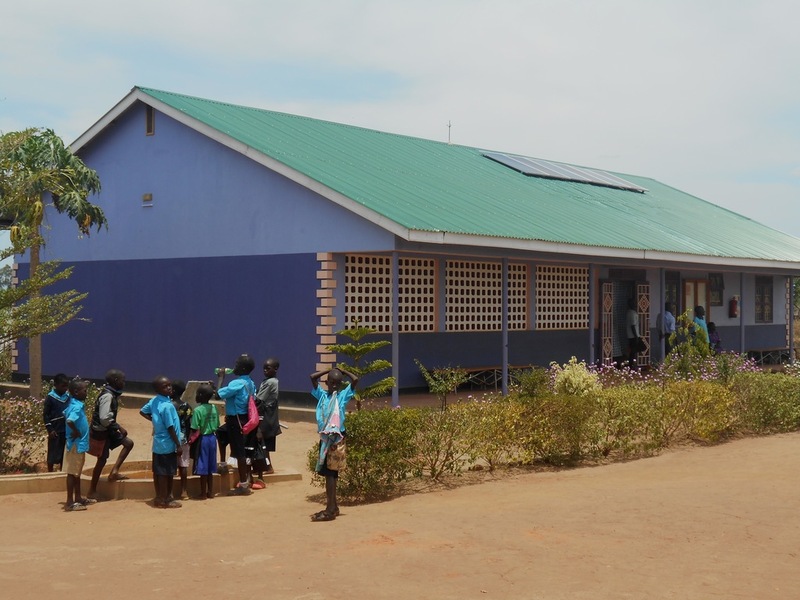 The clinic is located in one of the poorest areas of Uganda and its construction is a much needed source of employment for the local villagers. 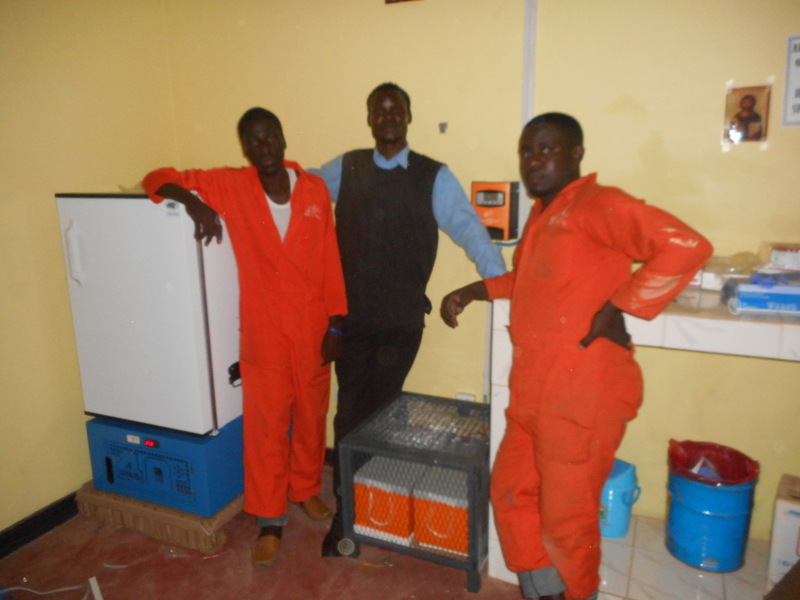 A Ugandan engineering firm from Gulu is directing the project and its onsite foreman ensures day to day progress. Fr. George keeps Fr. Joseph appraised of progress by email and they confer regularly regarding the overall project. We hope, upon passing inspection by the Ministry of Health, to begin seeing patients before the end of this year. Once we have opened and have raised more funds we will, God willing, begin phase two which will be the drilling of the well, installations of the well head, pump and generator and the piping of water to the clinic. Phase three will be the building of staff quarters and phase four will be the construction of a birthing and neonatal facility. 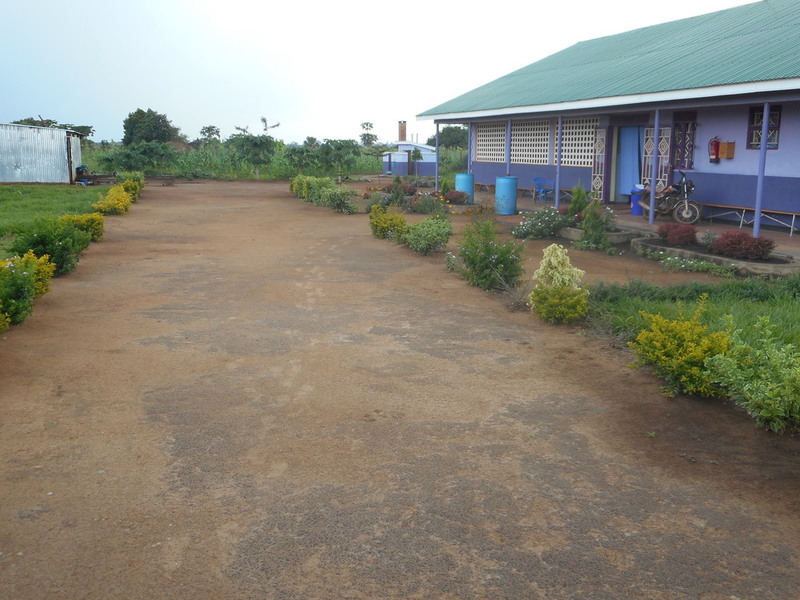 On December 9th, 2012, ground was broken at Akonyibedo village in northern Uganda for the construction of a medical clinic. In this area the people are just a few years out of the displaced persons camps and security is only now taking hold. Fr. 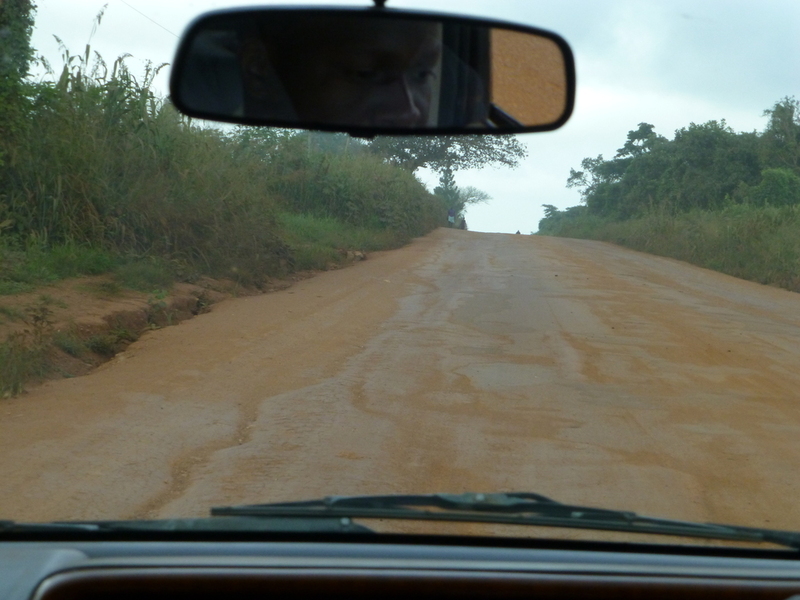 Joseph visited this area in 2010 as part of an OCMC medical mission team. 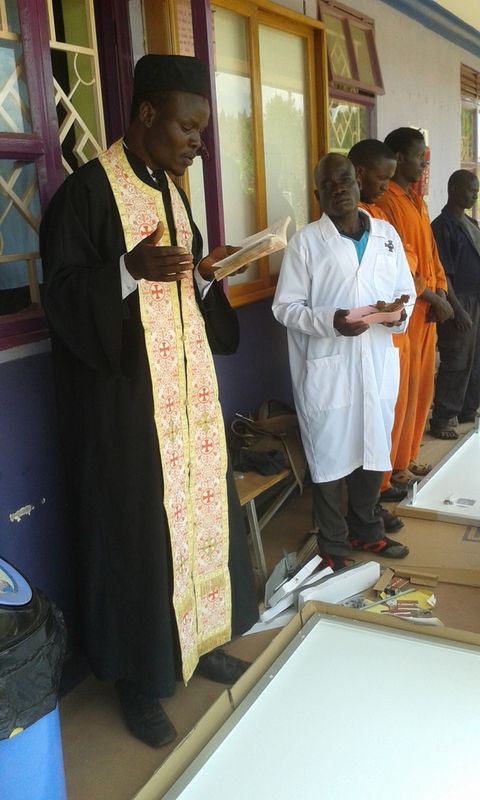 Moved by the need of the people for a permanent clinic, he sought and received in 2012 the blessing of Archbishop Jonah, Metropolitan of all Uganda, to attempt to raise the funds necessary to build and equip such a clinic. Through the generosity of both Orthodox and non-Orthodox, sufficient money has now been raised to begin construction. Despite having been involved in a serious motor vehicle accident two months prior, Fr. Joseph traveled to Uganda to meet with the Metropolitan, review plans for the clinic's construction and to help decide on the staff for the clinic. Sue Nelson, a nurse practioner, who has treated patients in Uganda for a number of years and with whom Father served on the 2010 medical team, accompanied him. Lovingly referred to by the Ugandan people as "Doctor Sue," her knowledge and experience regarding the medical needs of the people in Uganada had been very helpful in the planning and fundraising and her assistance was a great help on this trip, especially in suggesting changes to the proposed clinic plan and in interviewing potential staff. On Sunday the 9th of December, a Hierarchical Divine Liturgy was celebrated in the mud walled, thatched roof church at Akonyibedo village. After Liturgy, the land was blessed and the ground broken. Following that came speeches, native dancing and the serving of a meal. Local officals were in attendance and many people traveled long distances by foot to join in the celebration of a dream coming true. 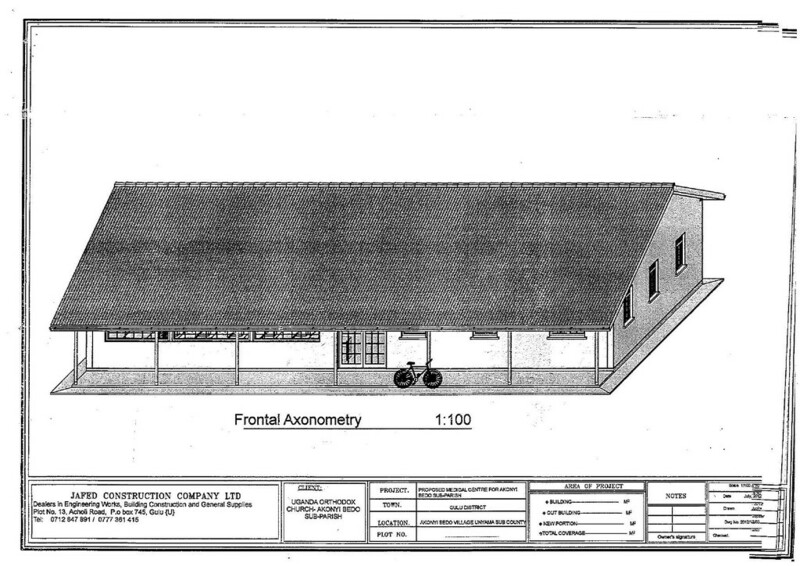 Above and below are drawings for the medical clinic in Akonyibedo, Uganda. The building has been staked out on the land and construction is underway.